Posted November 7th, 2013 at 11:53 am. 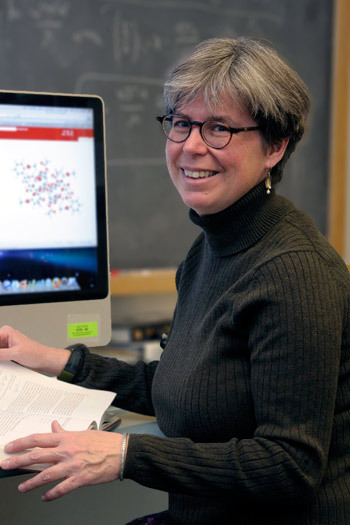 In this Chemistry World podcast, Bryn Mawr Chemistry Professor Michelle Francl is interviewed by Chris Smith, best known as the creator of the BBC radio program “The Naked Scientists,” about Chemophobia. Francl teaches courses on general chemistry and quantum chemistry. A podcast of her “Introduction to Quantum Chemistry” is available on iTunes. More of Francl’s writing can be found on her blogs The Culture of Chemistry and Quantum Theology. Bryn Mawr’s Chemistry Department combines high quality, visible research programs with excellent teaching. Students have the opportunity to work side by side with faculty as researchers. The chemistry major program of study includes introductory and advanced courses in the core areas of biological, inorganic, organic and physical chemistry. Advanced courses are informed by the research areas of bioinorganic, nanomaterials, medicinal, computational, organic materials, and nucleic acid and protein chemistry.